The month of August always reminds me of Barbara Tuchman’s Pulitzer Prize winning book, The Guns of August and its accounting of the events leading to the start of World War I. One hundred years on and here I am blogging about The Great War’s anniversary within the context of wristwatches. World War I was a war of staggering carnage and casualties with over 17 million killed. Many of the men on all sides who lost their lives did so in trench warfare –the trench being both their battlefield home base and their protective though dangerous ground zero. A catastrophic transition for time keeping that we are the beneficiaries of in our focus on the wristwatch as the most modern of time keeping necessities/ accessories. These trench watches, also called wristlets resemble pocket watches fixed onto straps with lug holders of various devices to secure them to bands. During the war, a number of companies, including the Waltham Company in the United States, Longines and Omega supplied such models to various countries' military procurement units and were bought by individual soldiers. Very often the watches had similar looks with enamel dials and white numerals that were very wide. These were painted or overlaid with radium as were the hands so that they could be seen at night. 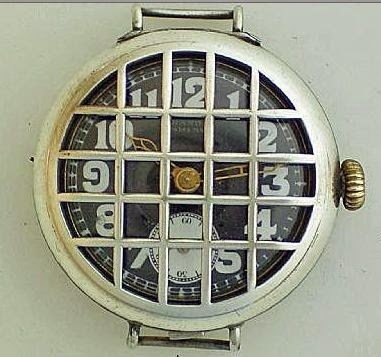 Many of the designs had metal grids resembling trench crisscrosses or grill screens allowing the dial markings to be seen but also protecting the dial’s crystal from flying shrapnel or other projectiles. Other models had full metal front covers. Below is one example, I have found on the web, but there are countless others that can be seen by searching the web. So what motivated me to write this short, exploratory post on trench watches? Another historical “trench” -- the moat surrounding the Tower of London. This summer in remembrance of the British and its colonial World War I fatalities, ceramic artist Paul Cummins and stage designer Tom Piper have collaborated on the ultimate reverential installation commemorating their country men’s sacrifices. Called, “Blood Swept Lands and Seas of Red,” the project consists of 888,246 ceramic poppies that are being planted in remembrance of the Empire's losses in Flanders’ poppy fields and elsewhere. Volunteers are planting these one-by-one on an around the clock basis in the Tower of London’s moat. The last one will be placed on November, 11, 2014 (Armistice Day). After Armistice Day, the poppies will be sold to the public and the proceeds in part distributed to six charities. I encourage you to take a look at other poignant images of the installation at the Huffington Post’s online site and follow the development of the plantings. I hope that some of the original trench watch makers and other companies sensitive to WWI's anniversary will pay tribute to this amazing effort and create poppy-red enamel dials or design poppy-inspired numerals to grace the face of new lines of trench watches. These would be the ultimate 21st Century remembrance pieces for the Sons and Dauughers of August, their families, and all of us seeking peace today.